Marker pen drawing on watercolour paper depicting a semi abstract landscape consisting of fields of Lavender on rolling hills with Pine trees beyond a small village under a setting sun. Abstract marker pen drawing on watercolour paper representing someone who has drank copious amounts of alcohol and this has released a normally suppressed side of their personality in which they berate the world for their own life’s difficulties while others surrounding them either laugh at or are bemused by their drunken behaviour. Marker pens on acrylic paper drawing depicting an expectant Mona Lisa gazing contently while pregnant at the viewer as she leans a set of wooden draws infront of a window displaying in a river running through a grassy valley as the sun sets behind the distant mountains. Marker pen on acrylic paper abstract drawing depicting the ghostly outline of a newly deceased Tiger whose colouration is being dissipated back into the jungle while an undergrowth of foliage has begun to spread over the Tiger remnants. 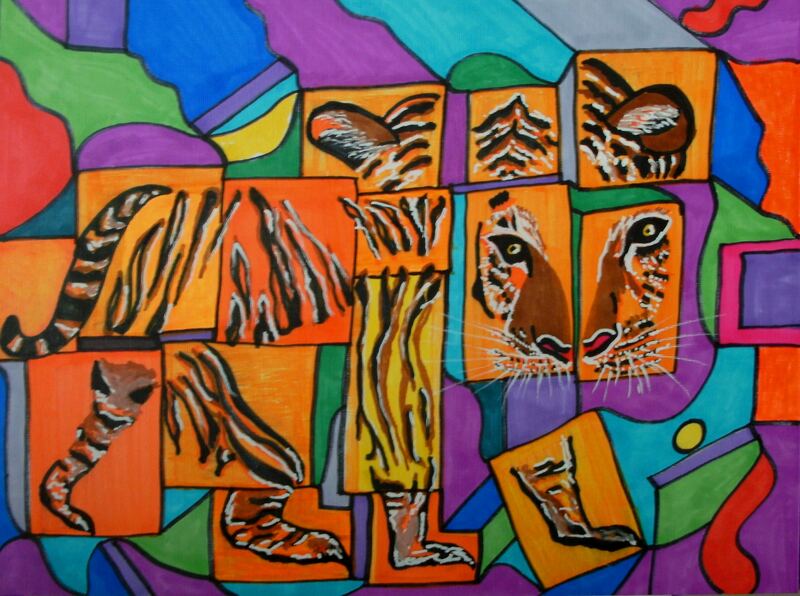 Marker pen on acrylic paper abstract drawing depicting a rare Bengal Tiger whose body is poached and dissected for the traditional medicinal trade.